201 , 207, 213 338053 W B-17G *Geaccepteerd door USAAF 22 Jun 44. *Cheyenne Mod Center 23 Jun 44. *Hunter Field 30 Jun 44. *Grenier 24 Jun 44. *8th AF 29 Jun 44. 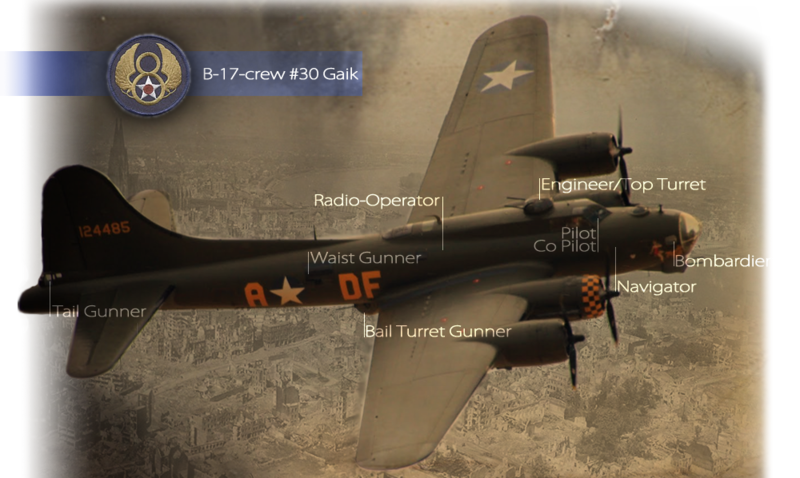 *Queen Ann B-17G *Geaccepteerd door USAAF 9 Okt 43. *Long Beach Mod Center 9 Okt 43. *Grand Island 22 Okt 43. *8th AF 9 Nov 43. *John Oliver, Francis MacKay, Stanley Davis, Von Schlegel WIA 11 Dec 43 bij Emden. *Thomas Parks WIA 4 Feb 44 bij Frankfurt. *Naar U.S.A. 9 Jul 45. *Naar Kingman 18 Dec 45. 214, 232, 234, 235, 245 46121 N B-17G * Geaccepteerd door USAAF 6 Mei 44. *Tulsa Mod Center 5 Mei 44. *Hunter Field 17 Mei 44. *Grenier 26 Mei 44*8th AF 28 Mei 44. *Rex Von Bergen WIA 28 Okt 44 bij Hamm. *Wiliam McVIcar WIA 30 Nov 44 bij Merseburg. *James Carroll, Alan P. Hamlin WIA 31 Dec 44 bij Hamburg. *Cletus Wadlow WIA 31 Mar 45 bij Zeitz. *Naar U.S.A. 30 Jun 45. *Naar Kingman 27 Nov 45. 225 48306 H B-17G * Geaccepteerd door USAAF 5 Aug 44. *Hunter Field 7 Aug 44. *Dow Field 29 Aug 44. *8th AF 1 Sep 44. *Linker landingsgestel afgebroken na de terugkeer van de missie naar Cheb, Czechoslovakia op 14 Feb 45. Geborgen. 252, 254 339079 R B-17G * Geaccepteerd door USAAF 14 Nov 44. *Hunter Field 25 Nov 44. *Grenier 9 Dec 44. *8th AF 11 Dec 44. *Naar 390th 2 Jan 45. *MIA Cheb, Czechoslovakia 14 Feb 45. Getroffen door flak, gecrasht bij Wiesbaden. Flanigan, Weldon POW, rest KIA. 238 338837 D B-17G * Geaccepteerd door USAAF 26 Sep 44. *Lincoln 27 Sep 44. *Dow Field 12 Okt 44. *8th AF 16 Okt 44. *Naar U.S.A. 3 Jul 45. *Naar Kingman 24 Nov 45. 227, 250 338393 V B-17G * Geaccepteerd door USAAF 30 Jul 44. *Cheyenne Mod Center 31 Jul 44. *Hunter Field 8 Aug 44. *Dow Field 30 Aug 44. *Assigned 11 Sep 44. 229 237723 U *Pay Dola *Johnny Walker B-17G * Geaccepteerd door USAAF 10 Aug 43. *Denver Mod Center 10 Aug 43. *Redmond, Oregon 15 Aug 43. *8th AF 8 Sep 43. *Andrew Wallner WIA 22 Mar 44 bij Berlin. *Naar U.S.A. 10 Jul 45. 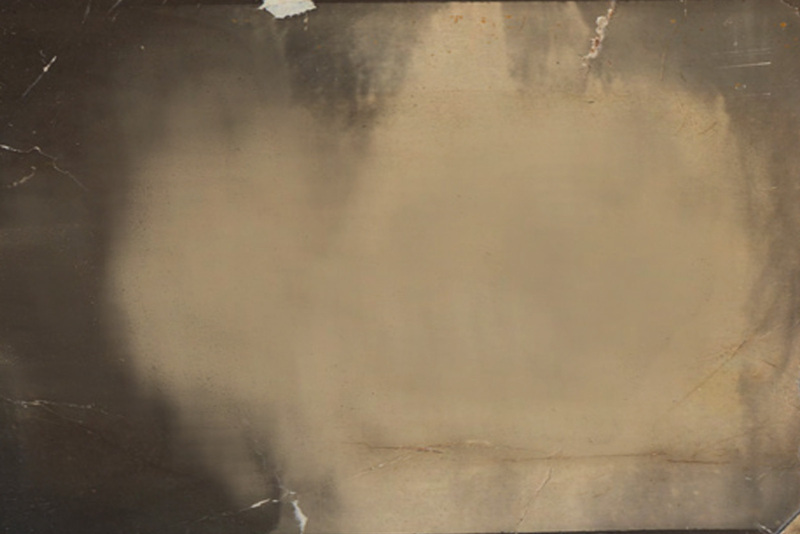 *South Plains 11 Jul 45. *Overbodig verklaard 12 Jul 45. *Naar Kingman 19 Nov 45. 218 2102967 A *The Diplomat B-17G * Geaccepteerd door USAAF 24 Apr 44. *Cheyenne Mod Center 26 Apr 44. *Kearney 7 Mei 44. *Bangor 20 Mei 44. *Dow Field 21 Mei 44. *8th AF 22 Mei 44. *John D. Davis WIA 24 Dec 44 bij Zellhausen. *Flinke gevechtsschade bij Chemnitz 6 Feb 45. Crew is met parachute gesprongen bij Guert, teruggekeerd naar Parham. Vliegtuig gecrasht ten oosten van Les Combes, Frankrijk in een tarweveld. Geborgen op 6 Feb 45. 224 297846 F *Belle of the Brawl B-17G * Geaccepteerd door USAAF 16 Mar 44. *Denver Mod Center 16 Mar 44. *Hunter Field 16 Mar 44. *Love Field 21 Apr 44. *Hunter Field 30 Apr 44. *Dow Field 30 Apr 44. *8th AF 5 Mei 44. *Robert R. Rice WIA 15 Okt 44 bij Köln. *Howard Brooks, radio operator, en John Cullen, waist gunner, KIA 14 Feb 45. *MIA Kaiserlautern 2 Jan 45. Rechter vleugel afgeschoten door flak. Allen POW. 197, 198, 199 2107010 E *Gloria Ann II *Close Crop B-17G * Geaccepteerd door USAAF 28 Jan 44. *Tulsa Mod Center 27 Jan 44. *Kearney 16 Feb 44. *Presque Isle 29 Mar 44. *8th AF 2 Mar 44. *Gecrasht bij Parham 1 minuut na het opstijgen op 27 Dec 44. Crew overleden. 201 , 207, 213 338053 W B-17G *Accepted by USAAF 22 Jun 44. *Cheyenne Mod Center 23 Jun 44. *Hunter Field 30 Jun 44. *Grenier 24 Jun 44. *8th AF 29 Jun 44. *Queen Ann B-17G *Accepted by USAAF 9 Oct 43. *Long Beach Mod Center 9 Oct 43. *Grand Island 22 Oct 43. *8th AF 9 Nov 43. *John Oliver, Francis MacKay, Stanley Davis, Von Schlegel WIA 11 Dec 43 at Emden. *Thomas Parks WIA 4 Feb 44 at Frankfurt. *To U.S. 9 Jul 45. *To Kingman 18 Dec 45. 214, 232, 234, 235, 245 46121 N B-17G *Accepted by USAAF 6 May 44. *Tulsa Mod Center 5 May 44. *Hunter Field 17 May 44. *Grenier 26 May 44*8th AF 28 May 44. *Rex Von Bergen WIA 28 Oct 44 at Hamm. *Wiliam McVIcar WIA 30 Nov 44 at Merseburg. *James Carroll, Alan P. Hamlin WIA 31 Dec 44 at Hamburg. *Cletus Wadlow WIA 31 Mar 45 at Zeitz. *To U.S. 30 Jun 45. *To Kingman 27 Nov 45. 225 48306 H B-17G *Accepted by USAAF 5 Aug 44. *Hunter Field 7 Aug 44. *Dow Field 29 Aug 44. *8th AF 1 Sep 44. *Left undercarriage collapsed after return from mission to Cheb, Czechoslovakia on 14 Feb 45. Salvaged. 252, 254 339079 R B-17G *Accepted by USAAF 14 Nov 44. *Hunter Field 25 Nov 44. *Grenier 9 Dec 44. *8th AF 11 Dec 44. *To 390th 2 Jan 45. *MIA Cheb, Czechoslovakia 14 Feb 45. Hit by flak, crashed near Wiesbaden. Flanigan, Weldon POW, rest KIA. 238 338837 D B-17G *Accepted by USAAF 26 Sep 44. *Lincoln 27 Sep 44. *Dow Field 12 Oct 44. *8th AF 16 Oct 44. *To U.S. 3 Jul 45. *To Kingman 24 Nov 45. 227, 250 338393 V B-17G *Accepted by USAAF 30 Jul 44. *Cheyenne Mod Center 31 Jul 44. *Hunter Field 8 Aug 44. *Dow Field 30 Aug 44. *Assigned 11 Sep 44. 229 237723 U *Pay Dola *Johnny Walker B-17G *Accepted by USAAF 10 Aug 43. *Denver Mod Center 10 Aug 43. *Redmond, Oregon 15 Aug 43. *8th AF 8 Sep 43. *Andrew Wallner WIA 22 Mar 44 at Berlin. *Returned to U.S. 10 Jul 45. *South Plains 11 Jul 45. *Declared excess 12 Jul 45. *To Kingman 19 Nov 45. 218 2102967 A *The Diplomat B-17G *Accepted by USAAF 24 Apr 44. *Cheyenne Mod Center 26 Apr 44. *Kearney 7 May 44. *Bangor 20 May 44. *Dow Field 21 May 44. *8th AF 22 May 44. *John D. Davis WIA 24 Dec 44 at Zellhausen. *Severe battle damage at Chemnitz 6 Feb 45. Crew bailed out near Guert, returned. Plane crashed east of Les Combes, France in a wheat field. Salvaged 6 Feb 45. 224 297846 F *Belle of the Brawl B-17G *Accepted by USAAF 16 Mar 44. *Denver Mod Center 16 Mar 44. *Hunter Field 16 Mar 44. *Love Field 21 Apr 44. *8th AF 5 May 44. *Robert R. Rice WIA 15 Oct 44 at Cologne. *Howard Brooks, radio operator, and John Cullen, waist gunner, KIA 14 Feb 45. *MIA Kaiserlautern 2 Jan 45. Right wing blown off by flak. All POW. B-17G *Accepted by USAAF 28 Jan 44. *Tulsa Mod Center 27 Jan 44. *Kearney 16 Feb 44. *Presque Isle 29 Mar 44. *8th AF 2 Mar 44. *Crashed at Parham one minute after takeoff on 27 Dec 44. Crew killed. 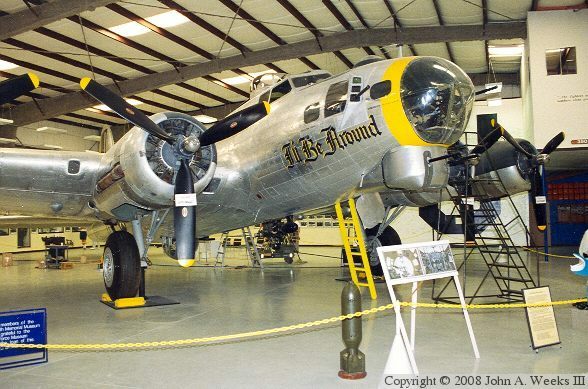 B-17 “I’ll be Around” at the 390th Museum, Arizona.